As Tillerman correctly guessed, the previous header photo was of the diminutive (6 feet 4 inches - 1.93 meter overall length) Cape Cod Frosty dinghy; the skipper deep in concentration, peeking out from behind the daggerboard. The Frosty name fits the function. The Cape Cod Frosty was originally designed in 1984 as a frostbite dinghy and, after a brief burst of popularity throughout Cape Cod, Ohio, and Maryland, is now found (during the winter months) fleet racing in a small lagoon off the fast-flowing Piscataqua River, on the border of New Hampshire and Maine. I have always been fascinated by, what I term, micro-dinghies; those sailing dinghies less than 8 feet (2.43 meters). 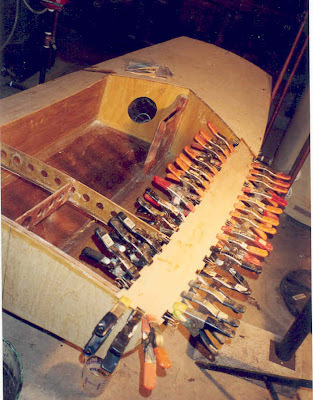 Immensely impractical (8 feet length overall is the smallest dinghy that most people can fit into and seems to sail well), I have been enthralled at those who attempt to design, build and sail Lilliputian vessels. In 2003, on a whim, I drove over to the Maryland Eastern Shore, where there was a Frosty for sale from the now defunct Salisbury fleet. The price was right - $200. I arrived there as night fell and in the dim radiance of a flashlight, checked that the boat had no holes and all the sailing pieces were there. 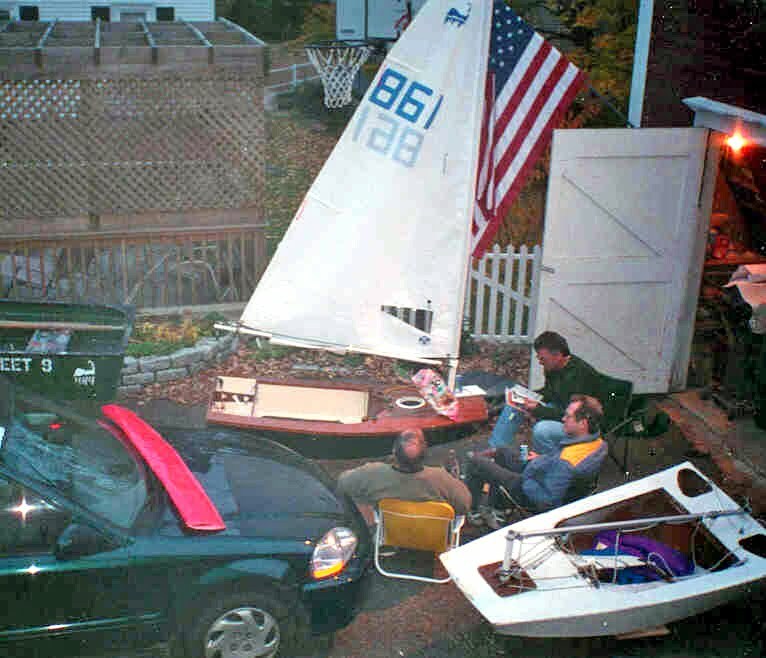 The check was written and off I drove, a proud owner of a 6 foot sailboat on the roof of the car. Only in the daylight of the next day could I see that the builder had managed to give the bow transom a considerable deviant angle from that of the stern transom. Somewhat disappointed at now owning a crooked boat, I nonetheless sanded and stripped the paint off, put a coat of primer on and worked on the mast step before losing interest and moving on to my Maser project. My Cape Cod Frosty remains to this day as a modern sculpture in white primer, perched upright on it's transom in my basement, much to my wife's chagrin. In 2004, now as a owner of a somewhat deformed Cape Cod Frosty, my curiosity at sailing these craft could not be thwarted. I finagled an invite to the Frosty nationals where they kindly lent me a working (and also completely competitive) Frosty for the regatta. The Frosty Nationals are traditionally held at the end of their frostbite season, around the mid to end of April if memory serves. I finished a creditable 8th out of 19 in my first and only Frosty regatta. To my surprise, where I thought there wouldn't be much speed difference in such a small dinghy, the top six boats had a clear advantage and the leaders could open up 1/2 leg leads on short frostbite courses. Here is a scanned photograph of the blogmeister rounding the weather mark in one of the 2004 National races. Another strange characteristic of the Cape Cod Frosty is that it sails best with the helm's weight forward; the bow transom is always immersed at least 1/2 way, pushing up an immense bow wave and one feels as if you're always sailing downhill. Race committee is done off a large floating square dock that is towed to the center of the lagoon; the floating dock is large enough to fit 10 Frostys pulled up. There was enormous incentive to finish in the top ten each race as one could pull his Frosty up on the dock, get out and stretch one legs. The tailenders were left to cope with creeping paralysis as they remained shoehorned into these tiny craft, race after race. Finally, toward the end of Saturday's racing, the RC took pity, kept the leading sailors off the dock and allowed the tailenders some respite; some had to pulled out of their cockpits, succumbing to Rigor Frostitus. I had a great time at the Cape Cod Frosty nationals. I would do it again but am now wondering whether my knees or hips would be up to the task. Here is another scanned photo showing the bow down attitude of the Cape Cod Frostys. The blogmeister is in the second row coming up to the weather mark. A photo looking down on a onshore Cape Cod Frosty klatch, a trio with camp chairs, the scene replete with a quaint New England barn door. One can get a true sense of how small these dinghies are. I haven't posted about the Sea Snark for some time so when I came across this video of that great little 11' foam lateen-rigged dinghy racing in the 2012 Archipelago Raid, I knew I had blog-worthy material. The Archipelago Rally is a small boat fun race out of Rhode Island with an emphasis on kids and parents participating. If you are an adult sailing by yourself, it looks like you are encouraged to dig up or modify something unusual. As a result there is a melange of small sailing boats - right up my alley. This is a video of, what I assume, are two sisters racing the Sea Snark. In the video you can see various sailing craft such as a Boston Whaler Squall, a C-class open canoe, a 16-30 decked sailing canoe and a traditional flat-bottomed saling skiff, all passing our intrepid Sea Snark sailors! "So how is everybody else doing?" And here is another, longer, video of the 2012 Archipelago Rally with a detailed look at the variety of boats making the trip including some of the history of the Sea Snark dinghy. Here is a link to a post on the 2010 Archipelago Raid. Bob Ames, who is a naval architect by day, (and night also when he draws up racing sailboats) is also an amateur videographer of note. The following video is the last in a series of four he put together about log canoe racing and, according to Bob, is to be the last one in the series as he is relinquishing a spot on the log canoe team in 2013 to drive a sport boat next season. No better way to time waste a winter evening on the Internet than watch a series of spills, mayhem and Maryland Eastern Shore culture on one of the oldest continuously raced sailboats in the world. Log Canoe Fever from B. A. on Vimeo.